They say a picture is worth a thousand words. 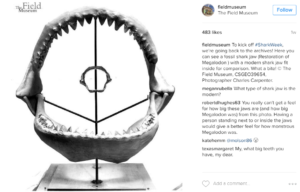 When it comes to museums, an Instagram picture is worth so much more. Museums break physical boundaries on Instagram by visually bringing their narratives to people who may never step inside their doors. The photo sharing platform connects new audiences to cultural institutions and heightens awareness and appreciation for their collections and missions. The Smithsonian does a fantastic job keeping their followers in the know. People want to know what is going on at their favorite institutions, beyond regular events and new exhibitions. Instagram is the perfect way to keep followers engaged with information they can’t find on your calendar. #SharkWeek is a cultural phenomenon presented by the Discovery Channel that brings in viewers by the masses. The Field Museum capitalized on this week-long event to show what fascinating shark artifacts they have in their archives. Find an authentic connection to a trending topic and add to the conversation with a compelling image. Instagram usage is particularly popular among millennials and Gen Z. And what we know about millennials and Gen Z is that they love, and trust, user-generated content. MoMA engages these groups through highlighting their audience’s own artwork. 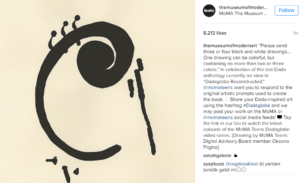 By posting images with a designated MoMA hashtag, an Instagram user has a chance to be featured on MoMA’s account. Remember that everyone loves a little fame. 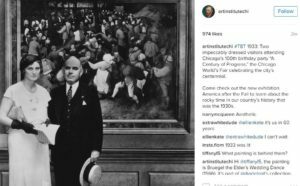 The Art Institute of Chicago does an excellent job sharing historical photos and in a timely way. They take advantage of the popular hashtag #TBT (Throwback Thursday) to show stunning photos from their collection and even share images taken within the museum throughout the years. Followers can’t help but feel a sense of nostalgia and the urge to “heart” the post. 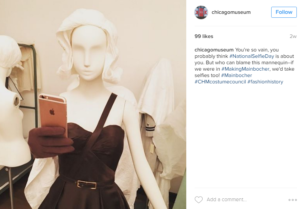 Follow the lead of the Chicago History Museum, who combined the hashtag #NationalSelfieDay, Carly Simon lyrics and a piece of their fashion collection to produce a clever, engaging post. Instagram allows you to have fun with your audience. If they follow you, it’s because they expect to be moved or amused by your content. Adjust your tone to see what works with your followers, and try being playful or witty. 500 million Instagram users are waiting to discover the hidden secrets and stories inside your museum. We know you’re no stranger to good storytelling and good visuals. Follow the best practices from the above museums to bring your favorite narratives to the masses. 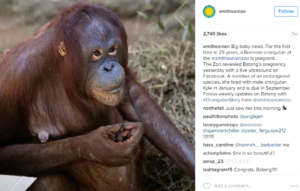 Are there other cultural institutions who kill it on Instagram? Share your favorites in the comments below!